Gambians are our West African brothers and sisters who deserve our help in their hour of need. I get that. But no one can truly help the other when they are themselves in need of help, when they are wracked by internal turmoil. 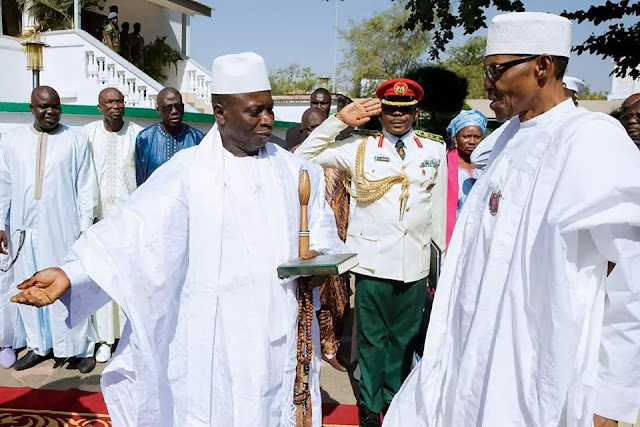 President Buhari has no business being in Gambia’s business while his country burns. Imagine for a moment that Nigeria's current president were a man called Goodluck Jonathan (or, for that matter, any southern Christian), and the military “mistakenly” dropped a bomb on hapless internally displaced Boko Haram victims, killing scores of them and critically injuring many more. Imagine again that such a president didn't deem it worth his while to visit the state where this grievous tragedy happened, but instead chose to go to another country to resolve the country's political differences. What would we northern Muslims be saying by now? Well, something close actually happened in late 2014. At a time Boko Haram captured Mubi, Adamawa's second largest town and former Chief of Defense Staff Alex Badeh's hometown, Goodluck Jonathan chose to travel to Burkina Faso to resolve the country's political crisis. The public denunciation that followed that presidential indiscretion was swift and massive. This was what I wrote in my November 8, 2014 column titled, "State of Emergency Amid Worsening Boko Haram Insurgency": "Amid the heartrending humanitarian disaster that Boko Haram has wreaked on Mubi, the president chose to travel to Burkina Faso to 'resolve' the country’s political crisis. Which sane person goes to put out another person’s fire while his house is up in flames? I have never seen a more cruelly insensitive and clueless response to a grave national crisis than this in my entire life." Buhari's situation is actually worse. The military he is commander-in-chief of, not Boko Haram, was singularly responsible for “mistakenly” killing scores of vulnerable, hungry and serially cheated IDPs, and all he has done is issue a “regret” through his Twitter handle. He didn’t physically travel to Borno State to condole with and comfort the people. He is more concerned with and consumed by what is happening in the Gambia than the humanitarian tragedy that is unfolding in his own backyard. To be clear, I don’t think the Nigerian air force deliberately targeted the IDPs. I don’t see what purpose that would serve. It is entirely reasonable to agree that it was genuinely an accident. But it’s a monumental, unprecedented national disaster nonetheless. It should have invited a solemn presidential national broadcast, not a mere tweet, which we all know the president didn’t even compose. It’s true that even well-trained military personnel like America’s have had occasions to accidentally bomb wrong targets in Afghanistan, Iraq and elsewhere. But we are talking here of a nation’s military accidentally bombing its own fellow citizens in their own country—and in their weakest and most helpless state! A Facebook friend of mine by the name of Solomon Wise captured the tragedy this way in his comment on my wall: “Ravaged by Boko Haram and forced to live in an IDP camp in their own country where Govt officials steal their food. Now mistakenly bombed.” This caused me to shed a tear. Call me a wimp if you like, but it did make me cry. Now, a presidential national broadcast to mourn this tragedy and a personal visit by the president to give emotional strength to the bereaved won’t bring back the lost lives, but it would show respect for the dead and show that the president cares and takes responsibility for the fatal error of the people he is commander-in-chief of. In no serious country in the world would a president fly to another country in the face of this unexampled tragedy and ask his Chief of Staff to represent him in condoling grieving families. I am not by any means minimizing the horrendousness of other humanitarian tragedies that the president has unwisely chosen to justify (such as the bloodcurdling military mass murders of Shias in Zaria) or ignore (such as the absolutely condemnable butchery in southern Kaduna and Agatu), but the accidental bombing, by the Nigerian military, of the survivors of Boko Haram’s unspeakable savagery amid the unconscionable governmental neglect they already suffered deserved a swifter, less insensitive, and more humane response from the commander-in-chief. There is no way to sugarcoat it: Buhari's response is at once clueless, cruel, and condemnable. Unfortunately, it fits a pattern that is emerging in his attitude to and relationship with the poor. He has a profoundly ice-cold contempt for the poor. Although he has traveled to virtually every continent in the world and has budgeted hundreds of millions of naira this year to travel to even more countries, he has never visited the theaters of Boko Haram insurgency. He simply sits in the luxury of Aso Rock and proclaims the “technical defeat” (whatever in the world that means) of Boko Haram and talks to soldiers on the front lines via closed-circuit television. What would it cost the president to pay a symbolic visit to the northeast—and elsewhere? When he was soliciting votes from potential voters, he traveled to every state except Yobe. He campaigned in Borno and Adamawa, which were gripped by a fiercer confrontation with Boko Haram than now. Why won’t the president visit Borno now, especially in light of the quick succession of tragedies that have hit the state? Before the “accidental” bombing of IDPs, a University of Maiduguri veterinary medicine professor and 4 others were murdered by a 7-year-old Boko Haram suicide bomber. Well, you know, the victims are poor, unknown people who are of no consequence to the president. When former Vice President Atiku Abubakar’s daughter got married in Adamawa, the president braved out the “odds” (never mind that he says he has “technically defeated” Boko Haram) and physically attended the wedding ceremony. Nobody represented him. He even said his wedding-induced visit gave him a glimpse of the suffering of the people of the state and caused him to shed tears, hopefully not crocodile tears. Had a humanitarian tragedy struck Adamawa, you can bet your bottom naira that the president won’t personally go there. Apparently, poor people don’t matter—unless their votes are needed as ladders to climb to power. Perhaps a rich, politically connected Borno man should marry off his daughter and invite the president. Maybe that is what it would take for the president to visit Borno. All people who want the president’s presence in their states should replicate this stratagem. It appears that, for President Buhari, who had been falsely thought of for years as a defender of the talakawa, only the rich matter. That’s why he attends rich people’s festive occasions outside of Abuja and instructs his media aides to issue presidential birthday wishes on the occasion of rich people’s birthdays, but picks and chooses which tragedies involving poor people he comments on or commiserates with. To be fair to Buhari, most, perhaps all, Nigerian politicians deeply disdain the poor. We only thought Buhari was different. He obviously is not. Sad.